20111001Brooklyn Bridge march reporting, a set on Flickr. As you can see, we visited Liberty Square (arriving late), made our way to Brooklyn Bridge (Church st, Vesey, Park Row) Marchers at Centre & Chambers were then blocked from south by cops who came tearing in from Vesey (4:05-11). We couldn’t reach them (and looking at the nervy cops, didn’t want to), so we went down Frankfort as march entered the bridge. Cops had by that time (c.4:15) blocked FDR & Pearl Street entrances to bridge on both sides. Cops were telling motorists on Pearl that Protesters were blocking the bridge (c. 4:17). Literally at the moment marchers entered the bridge. Exit/ entrance stairs were blocked by cops (so no exit allowed from ped walkway). From below we could see only cars, no peds, on south roadway (c. 4:15-20). From that point we moved to South Street Mall (third level) to get view of whole bridge. At that point data service on AT&T — which had been nothing, not even E while voice had five bars — returned. Saw arrests, police helio (only: at one point c. 6pm a press helio arrived. Stayed ~ 1 min before police helio returned and press fled or were ordered by traffic control, up the East R out of sight at rapid clip), At that point busses appeared on bridge to take arrestees: we could identify six in all. Also post helio incident, s police patrol boat positioned south of bridge, and tourist boats and other small craft made 180 degree turns both north and south out of area. Assuming there were radio orders at that time to clear river of civilian craft. 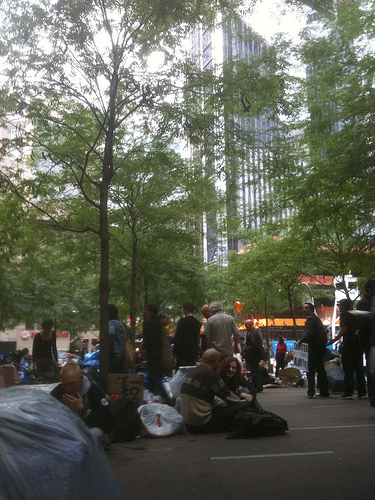 Took pictures and monitored updates till 7pm, arrived Liberty Sq 7:20, via Wall Street. On Wall pairs of cops stationed at every building entrance, four plus a whiteshirt at the Trump building, all looking v worried. Arrest the messenger. RT @MsRaeJones: @Antiwarcom They just arrested the folks who were shooting the live feed. NYPD brass bought and paid for by Wall Street: explain again why libertarians hate #occupywallstreet ? <a href=”http://www.ericallenbell.org/group/occupy-wall-street/forum/topics/j-p-morgan-chase-donates-4-6-million-to-nypd” rel=”nofollow”>www.ericallenbell.org/group/occupy-wall-street/forum/topi…</a> <a href=”http://www.ericallenbell.org/group/occupy-wall-street/forum/topi..” rel=”nofollow”>www.ericallenbell.org/group/occupy-wall-street/forum/topi..</a>. US Day of Rage ? USDayofRage US Day of Rage ? Arresting thousands of protesters on the Brooklyn Bridge? NYPD should get paid for doing #OccupyWallStreet’s PR. the view from brooklyn bridge is peaceful revolution. occupy wallstreet. ← Finding Bin Laden and Failing.